With summer fast approaching, the attorneys at the Jurewitz Law Group in San Diego can’t help but think nostalgically of those carefree days of childhood when we would hear the chime of a truck echoing through the warm air and would race to the curb, knowing that the ice cream truck would soon sate our appetite with something sweet and cold. Today, we take it for granted that we can go just about anywhere to pick up ice cream, or in the case of an ice cream truck, it can simply come to us. But at one time, ice cream was a luxury and serving it was considered a symbol of status. Although ice cream’s origins are veiled in confusion and lore, it has been said that the Roman emperor Nero would dispatch his servants to gather snow from mountaintops. That snow would then be mixed with fruits and honey and served to him. Although this same concept was used throughout the world at the time, it wasn’t until 1600 that scientists in Italy discovered a process for on-demand freezing and the true ice cream renaissance was born. Still, ice cream was only a treat enjoyed by the elite. Eventually, ice cream recipes were brought to America from English settlers and it has been said that George Washington and Thomas Jefferson were huge fans. Jefferson was so enamored with ice cream that he built himself an icehouse. Ice was hard to come by and vanilla and sugar were expensive, so ice cream was still reserved for the rich and famous. However, America being America, that was not going to last. The ice delivery industry exploded in the 1800s making the delivery of ice to homes much more affordable. Tinkerers and innovators improved the hand-crank ice cream maker and soon it was a simpler proposition to make ice cream at home. A new wave of immigrants, looking for something innovative to sell on the street, started selling frozen treats from carts; the precursor to the ice cream truck. It has been said that ice cream sandwiches and “penny licks” sold from carts on New York’s streets broke down social barriers; with Wall Street barons and blue-collar workers alike gathering together at carts to enjoy a cold treat. It wasn’t until the 1920s that an Ohio candy maker named Harry Burt had a revelation that would change everything. It was an age when Henry Ford was mass-producing affordable automobiles, so Burt just put two and two together. He and his son had already invented the Good Humor bar, so why not use the automobile to get his ice cream to the masses? He invested in 12 refrigerator trucks and dressed the operators in clean white uniforms. Those trucks then followed specified routes so families would know when to expect the trucks to come by with his ice cream. To top that off, a bell (which had originally come from his son’s bobsled) chimed to let children know the Good Humor Man had arrived; and thus the sound became synonymous with the ice cream man. Sadly, the last of the Good Humor trucks were phased out in the 70s, but ice cream trucks still circulate around neighborhoods across the nation. 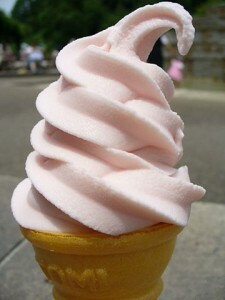 Americans eat an average of 20 quarts of ice cream a year. Next time the ice cream man rolls around in San Diego, we plan on stopping him to begin the work of meeting our quota. We suggest you do the same.